More info on the gallery website here. Walks, 2012, found objects and graphite on table. 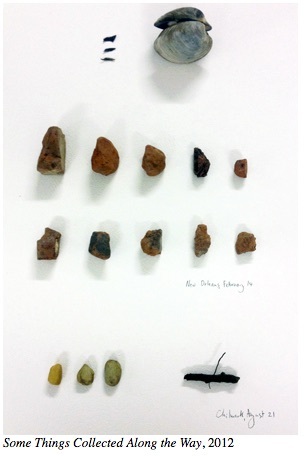 Some things collected along the way, 2011-2012, found objects and graphite on table. Shadows (Mint), August 19, left: 7.05am, right: 7.12am, 2012, pencil and charcoal on paper. Shadows (mint), August 19, left: 9.15am, middle: 9.20am, right: 9.21am, 2012, charcoal on paper. Shadow Lines, 2012, found twig, pencil and ink on paper. Shadow, chalk on painted table. Shadow (Parsley), August 23: 7.30am & August 24: 7.30am, pencil and ink on paper.